Dr Hannah George is Lead Clinical Psychologist for the Northern arm of National Deaf CAMHS (Child and Adolescent Mental Health Services). Her role covers the whole of the North of England and she is also involved with Deaf CAMHS at the National level. Hannah has been working with Deaf CAMHS for almost 7 years and leads the Deaf CAMHS autism assessment pathway. 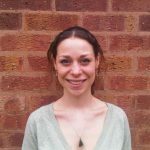 Hannah has a special interest in the development of more effective procedures, processes and tools to enable more timely and accurate assessment of Deaf children for Autism Spectrum Conditions.